Thought I'd add a picture to this group. I took this picture at the end of December, while I was in Phonsavanh, Xieng Khouang Province. 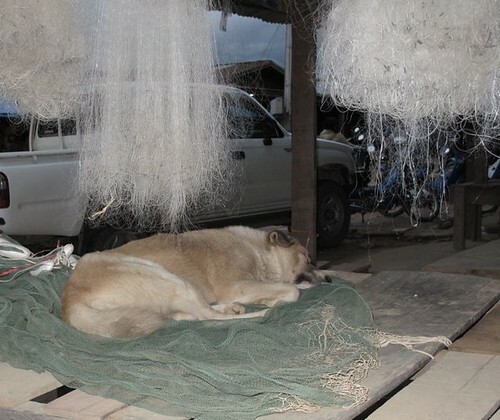 I cracked up when I saw the dog sleeping among the fishing nets, and on top of a fishing net. These nets are made of nylon and hand woven; people will work on the nets while sitting near the fire after dinner while telling stories. For pictures of other critters around the world, check out Camera Critters. The saying is let sleeping dogs lie, I agree cute image. What a cute dog...he does look very comfortable. You must've had an amazing trip! He looks comfortable, hope he doesn't get his feet tangled in the nets.